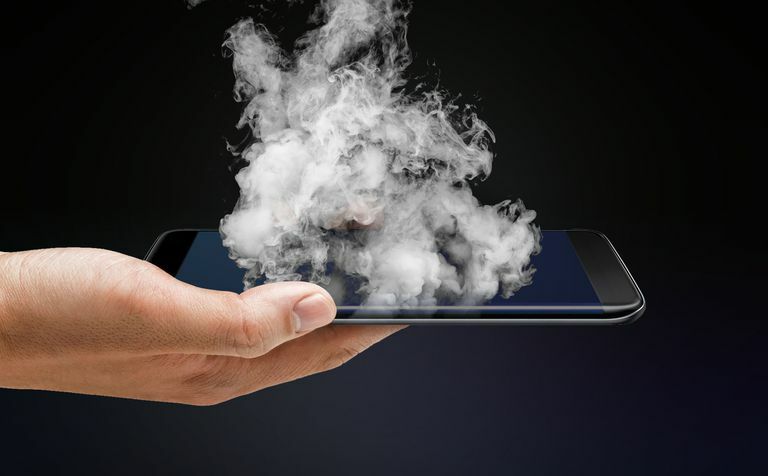 When it comes to something as serious and potentially dangerous as a smartphone exploding, it's essential that you have all the facts and understand the whole situation. No one wants to endanger their safety for a gadget. So let's cut to the chase: do you have to worry about your iPhone exploding? The answer is almost certainly not. What Happened With the Samsung Galaxy Note 7? There have been a few cases over the years of phones exploding, but they never seemed anything other than random and isolated. Concerns about phones exploding increased substantially in 2017 after Samsung had so many problems with its Galaxy Note 7 that the company recalled it. The U.S. Federal Aviation Administration even banned carrying the device on U.S. flights. Even after Samsung's official fix, the devices still can't be brought on planes. But what happened? It wasn't spontaneous combustion. It was a problem with the device's battery. There were actually two different problems with the batteries that were introduced during manufacturing. Both issues led to short circuits that ultimately caused the devices to catch fire. The battery is the key thing here. In any instance of a smartphone or other device exploding, the battery is most likely the culprit. In fact, any device with a Lithium Ion battery like those used by Samsung, Apple, and most other companies could explode under the right (though relatively unlikely) circumstances. Understanding what's meant by "exploding" is important, too. That word might make you think of a bomb-like explosion from a Hollywood movie. That's not what happens with phones. While technically there is an explosion or short circuit, what really happens is that the battery catches fire or melts. So, while a faulty battery is dangerous, it's not as if shrapnel goes flying all over the room. There have been reports over the years that iPhones have exploded. These cases were likely also caused by problems with the battery. And here's the good news: your iPhone exploding is not remotely likely to happen. Sure, it's theoretically possible for it to happen. And yes, when it does happen it's an event that gets in the news, but do you know anyone that it's happened to? Do you know anyone who knows anyone that it's happened to? The answer for almost everyone is no. Because there's no centralized place to report these incidents, there's no official count of how many iPhones have exploded all time. And there's really no way to create a master list of all iPhone batteries that have had catastrophic incidents. Instead, we just have to base our sense of the problem on news reports and that's not very reliable. What is safe to say is that the number of iPhones whose batteries have exploded is minuscule compared to the total number sold all time. Remember, Apple has sold over 1 billion iPhones. As we noted, there's no official list of these issues, but if it was something that even one in a million people experienced, it would be a major scandal. A comparison may be helpful in assessing the danger. Your ​odds of getting struck by lightning in any given year are about one in a million. Your iPhone's battery exploding is probably even less likely. If you're not regularly worried about lightning, you don't need to be worried about your phone exploding, either. What Causes iPhones and Other Smartphones to Explode? Hardware Failure: While not super common, manufacturing flaws in the device, especially related to the battery, could lead to an explosion. Overheating: Apple says that the iPhone should not get hotter than 113 degrees F (45 degrees C). If your phone gets that hot, and stays that hot for a period of time, its internal hardware could be damaged (you may see a temperature warning on the phone's screen). That damage could cause the iPhone's battery to catch fire. You should especially watch out for phone cases that don't allow proper air flow which can cause the iPhone to get too hot. Using Low-Quality Accessories: Lots of people go through many USB charging cables or lose the wall power adapter for recharging the phone. Many people also want to save money when they buy replacements and don't purchase official Apple products. The issue with low-quality accessories is particularly important. The more you dig into the differences between official Apple-made and Apple-approved chargers and the third-party knock-offs, the clearer it becomes that cheap chargers are a real threat to your phone. For a great example of that, check out this teardown that compares an official $30 Apple charger with a $3 version. Look at the difference in quality and in the number of components used by Apple. It's no wonder that the cheap, shoddy version causes problems. Whenever you're buying accessories for your iPhone, make sure it's either from Apple or that it carries Apple's MFi (Made for iPhone) certification. A bulge at the back of the phone. Before batteries explode, they often start to bulge and swell. A hissing noise coming from near the battery. The phone getting very hot and not cooling down. If your iPhone is exhibiting any of these signs, that's bad. Don't plug it into a power source. Put it on a non-combustible surface for a while to make sure it doesn't catch fire. Then take it straight to an Apple Store and have the experts inspect it.